Mary Grace Café is one of those places we go to if we’re looking for good food and great ambiance. Because we live near Robinsons Galleria, their branch at this mall is the one we frequently visit. We have recently had dinner there with our usual fare: soup, breakfast all-day meals and dessert. afé Mary Grace’s soup offerings are truly hearty, like they promised. 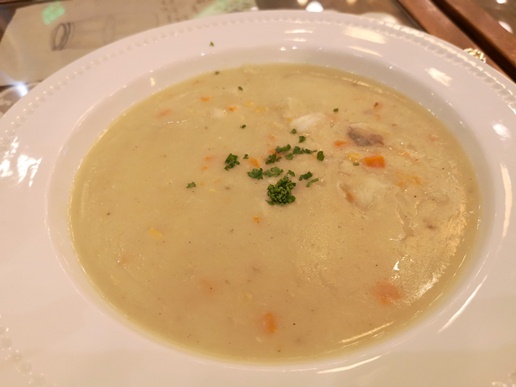 We’ve tried their Seafood Chowder and Wild Mushroom Soup, and we loved them both! Made with seafood broth, this Seafood Chowder (photo above) has cream dory, clams, mussels and prawns. So healthy and yummy! 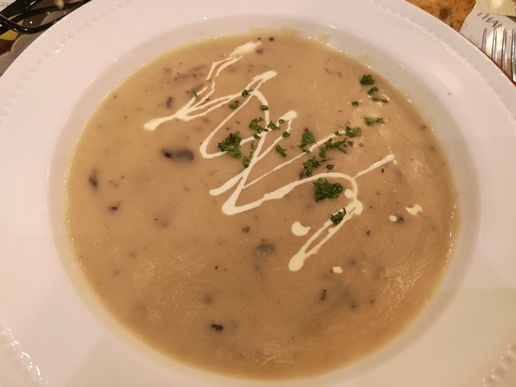 This Wild Mushroom Soup combines the meaty and smoky flavor of shiitake mushrooms, rich cream and milk. It’s smooth and flavorful and definitely one I’d love to have again on our next visit. All three of us ordered their Breakfast All Day meals for dinner. All breakfast meals are served with either eggs (scrambled or sunny-side up) or omelet (ham and cheese omelet or mushroom and cheese omelet). 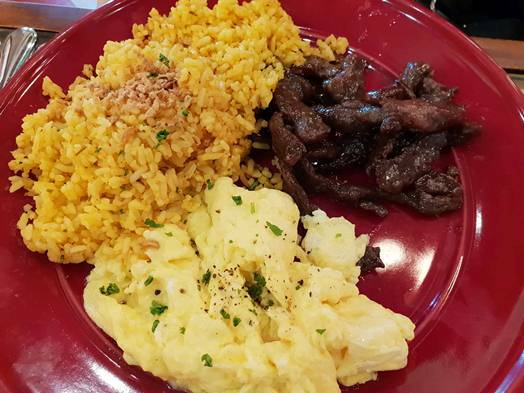 I chose to have scrambled eggs for my Sirloin Beef Tapa. The meat has a subtle sweetness to it and not salty, which I liked. It wasn’t as tender as I expected but manageable nonetheless. 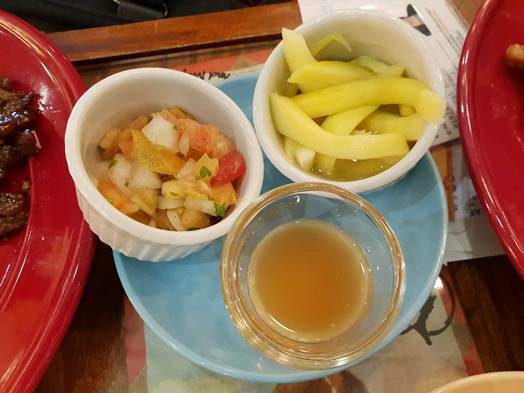 Each breakfast meal order comes with these condiments, too: tomato and onion salsa, pickled mangoes, and spiced vinegar. My fave are the pickled mangoes. 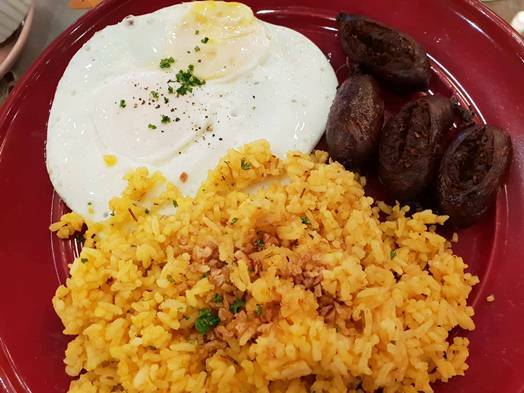 Vigan Longganisa was the perfect choice for hubby who loves his longganisa garlicky, salty, tangy and spicy. How was our son’s Pork Tocino? 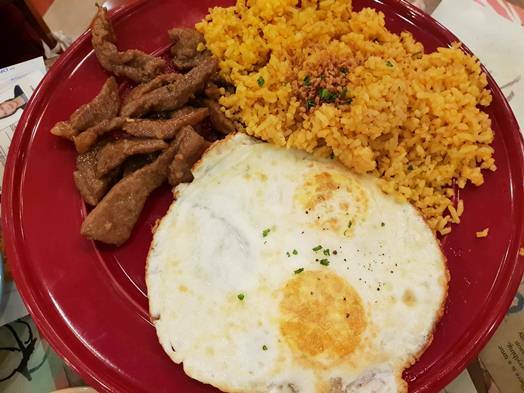 My son shuns pork fat, so I appreciate that Mary Grace Café offers fatless tocino, and they’re tender, too. He wasn’t able to finish all the meat, though, as he was busy gorging on his sunny-side up egg as well. 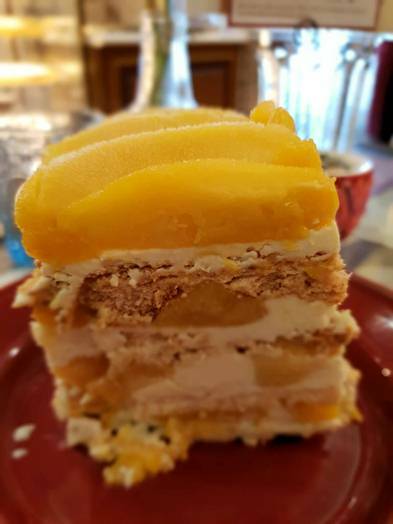 If you love mangoes and cakes that are not overly sweet, then this Mango Bene would suit you best. Sandwiched between frozen layers of meringue with custard cream are fresh and sweet ripe mangoes that would give your hearty dinner that extra oomph. It was a lovely dinner at Mary Grace Café, and we are looking forward to our next visit. This entry was posted in Mary Grace Café, Robinsons Galleria. Bookmark the permalink.